A type of spatula that is built to blend, fold, combine, and scrap food ingredients as they are being prepared. Constructed of blade materials that can be easily bent, flexible spatulas are typically made of silicon plastic or rubber, some of which can be used for work with higher temperatures, such as heat resistant spatulas that can be used for foods and temperatures reaching 300º F or higher. However, no spatula blade should be allowed to rest in foods or on areas that have increasing temperatures as the blade may become permanently altered when the heat softens and reshapes the blade into a curved form. 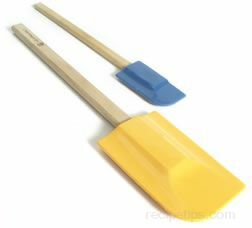 Flexible spatulas are manufactured in a variety of different sizes, shapes and colors as well as different handle materials. When selecting, consider the type of blade desired for the tasks most often undertaken. The spatulas are available with flat blades that are narrow or wide, or spoon blades that can scoop and hold various amounts of sauces or other ingredients more liquid in texture. All blades should resist absorbing grease and moisture but they may not resist absorbing the colors of the food, such as tomato or beet-based ingredients. Narrow blades work well in narrow spaces or for small tasks while wider blades work better for folding ingredients or mixing larger amounts and heavier ingredients, such as cookie dough or potatoes. The spatula should be dishwasher safe. Check the handle to make sure it is constructed so it is comfortable, easy to grip, securely attached to the blade, and well balanced to work effectively for the planned chores.